The CZ rimfire rifles has been produced since 1954, back then it was known as the BRNO Model 2, it was relaunched in the 90's as CZ 452 and in 2011 it was replaced with the CZ455, much the same rifle but with the possibility to change barrels so you could use 22lr and 17hmr in the same rifle. A great feature! So why is the CZ rimfire rifles so popular? It is an affordable rifle that shoots well for the money just as the other CZ rifles to. We have several of them from 22LR up to 458 Lott. The CZ rifles are in general are known as a "Workhorse" rifle. They just work. The finish on bled parts is often not 100% matching, and the trigger could use an upgrade in my view. Other than that there is not much work that needs to be done to the rifle other than changing the stock of course. GRS has produced stocks for the CZ 452 and 455 for years, it was the first 22lr rifle we made stocks for. My favorite GRS stocks for these rifles are the Sporter and hunter model. It is often shot prone with the use of bipods and a rear bag for support. Groupings at 100 meters with CCI ammunition is around 1 MOA (minute of angle) in calm conditions which is ok.
Pictures are taken by our GRS dealer in France, Armurerie Lavaux. The beauty about training with a 22 rifle as I wrote about in my previous blogpost is that because the bullet travels so slow down the barrel (as with air rifles) it shows very quickly if you have inconsistency with trigger control or if you are flinching. 22LR shooting is an excellent way to remove bad habits. It is also very affordable to shoot volumes. The 17HMR is a bit pricier on the ammunition, and the bullet is faster which makes it better for the hunting side of the rimfire family. Rimfire is an excellent way to introduce new shooters and hopefully the new generation hunters into the sport. With the adjustments on the GRS stocks it is easy to adjust the length of pull to fit the individual shooter. Try it, bring your kids, partner or family member the next time you go shooting with your rimfire rifle, always good fun! 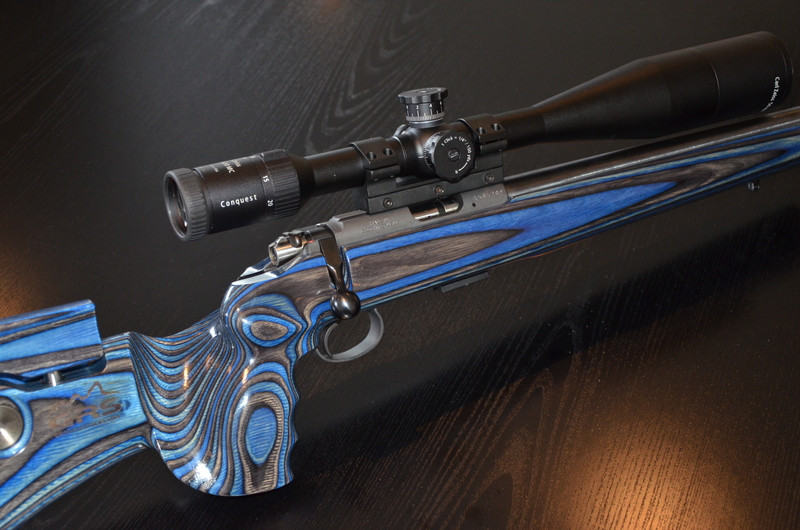 On the next blog post we will write about the Sako Quad rifle. Awesome bit of kit! Did you like this blogpost? Share it with others, and remember to follow us on Instagram, Facebook and YouTube!